In part 1 we looked at extrinsic factors, so now we will focus on intrinsic factors that contribute to running injuries. These are factors that relate to the individual runner, and are generally within the runner’s control. That is, if you get all these factors right, you have an excellent chance of running injury free and really enjoying you’re running… and possibly setting some personal bests! 2. Relaxed shoulders with elbows bent at 60-90 degrees and elbows in. ground and footstrike with midfoot rather than heel. cross centre of body but move forward and back. forward momentum and reduces braking effect of heel strike. I have also posted a video on the key elements of running posture based on my clinical experience and knowledge as a Physiotherapist and a runner. Tip: Get someone to video you running and look to see if you are incorporating the general principles above. If not, try to add in one element at a time, practising your running slowly and mindfully. Also consider what feels comfortable to do, as we are all built slightly differently. If in doubt, consult a trained professional who is a runner, such as a coach or Physiotherapist. This may seem obvious to some, but needs to be clarified. If you have suffered an injury in the past, especially to a lower limb muscle, joint, ligament or tendon(tendons are the end point of a muscle that attaches it to bone- ligaments are the non contractile structures that reinforce a joint), this can increase the risk of running injuries, as documented in the research. This is particularly relevant if you have not had the injury treated or followed through with the appropriate rehabilitation. There may be residual muscle weakness, muscle tension or shortening, joint stiffness, neural tension, proprioceptive loss(loss of joint position sense), scarring or motor control deficits, that will only come into play when the body is placed under more load with running. Most of these dysfunctions may not be detected by the individual, as they are sub clinical(not causing any symptoms). They will affect the way the body moves, and also affect recovery. Even upper body injuries can affect running, as the arms and shoulders move, and the torso rotates as you run. In the clinical setting, we have seen hip pain that is being triggered by shoulder dysfunctions, and foot pain that can be traced back to dysfunctions in the thoracic spine(you can find many more examples of this here). This is because the body is largely interconnected, and one region will affect another at some level. This concept is called Regional Interdependence, and there is a growing body of research to support it. Tip: Make sure you get all injuries checked out by a qualified health professional, and follow through with your rehabilitation as prescribed by the practitioner. If you are just starting out, or wanting to increase your volume or intensity, it may be worthwhile having a thorough musculoskeletal assessment by a trained health professional, to detect any imbalances/dysfunctions before they become a problem…an ounce of prevention is worth a pound of cure! You may also find my ebook helpful… it has lots of tests you can perform to detect for muscle weaknesses, and exercises to fix them and strengthen your body to cope with the demands of running. This follows on well from history of past injury, and is definitely a significant contributing factor that we see clinically for running injuries. Basically, you do not need to have had a past injury to have a musculoskeletal dysfunction. All of us have these in some shape or form, and they essentially take the form of muscle tension/knots/guarding, joint stiffness, neural tension(nerves not sliding properly…more on this in another post), loss of flexibility or strength in a muscle or region of the body, or loss of optimal muscle activation/control for a particular part. These usually result from poor postural habits, sustained positions like sitting/driving which increases strain on the spine and neck, and repetitive tasks such as bending and lifting. Caring for young children, lifting grocery bags, gardening, vacuuming and mopping are other routine activities that place some strain on the body and can lead to dysfunctions developing. In my opinion and clinical experience, these are the primary causes of most non-traumatic running injuries (those conditions that develop slowly over time). Increases in volume, intensity or other extrinsic factors can trigger these issues, but these exist well before hand, lying dormant until the strain threshold in the body is exceeded. If you would like more information about musculoskeletal dysfunction and pain you can find more here. Strengthening your body will help address some of the dysfunctions, as some of them will relate to muscle weakness. See the link above for my ebook. A good stretching routine is also important, particularly if you are an older runner,. This is best performed on non-running days or as part of recovery after a run (more on this in another blog). 4. Number of years running. 1. 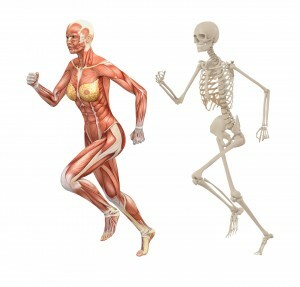 Adaptation by the body to the forces experienced in running. The human body has an amazing ability to adapt to virtually any condition and load placed on it, as long as it has time to adapt. Muscles and tendons become stronger with years of running, and joints also adapt to loads placed on them. Efficiency also improves as you practice a skill, so the central nervous system(brain) finds more efficient muscle recruitment pathways to perform the same task. This applies to any sport or motor skill, like riding a bike or playing a musical instrument. Eventually, less muscle effort and energy is required to perform the same task. Tip: Give your body time to adapt to running and your enjoyment of it will increase. If you are just starting out, 1-2 runs/week is good. You can progress to 3-4 runs/week after about 6 months, and after 1 year you can look at increasing volume and intensity of each session more. Educate yourself about appropriate strengthening and stretching exercises, and what foods that will help your running.